Hard to believe that we are all knee-deep in holiday shopping at this point… or at least I am. I try to be pretty organized and get it done as fast as possible to enjoy the last few weeks before Christmas stress free. With that said, I wanted to share my biggest shopping trick so you can do the same. Having those weeks with my family without the stress of running around to stores or having to hunt down deals is priceless. I want that for you too! For a few years I had heard of Ebates and just never really looked into it much. About a year and a half about I finally bit the bullet and signed up, installed the plugin to my browser, and then downloaded the app. I figured, OK let’s see what this Ebates thing people tell me about is all about! You guys. WHAT WAS I WAITING FOR! I am someone who does 95% of my shopping online. I hate malls, I hate crowds, I hate lines. On Black Friday I would much rather cuddle up and watch Christmas movies with my boys than leave my house at 4AM to go shopping to make sure I can get the same deals you can get online. When I signed up for Ebates in May 2017 (just about a year and a half ago) I used a friends sign up-which is the best way to do it. That way she got a credit and I got a $10 credit before I even started shopping! I had $10 just in my account ready to send back to me! It was a win for both of us! Once I signed up I could not believe how many of the stores I was shopping at had cash back options! So take Lululemon for example. If there is 5% cash back and I spend $200 I get $10 right away! Then it just banks in my Ebates account till cash out time AKA big fat checks! 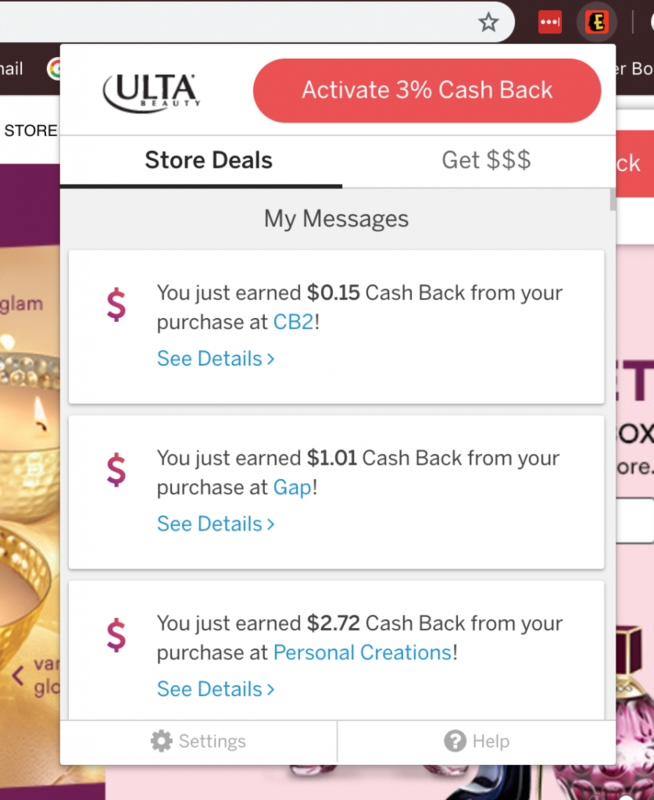 Then I headed to Ulta and again cash back options. So all the things I normally buy: clothes for myself and Liam, toys for him, diapers, photo prints from Walgreens, groceries, makeup, you name it I get cash back. So you are probably thinking to yourself: “HOLD ON! Why am I not signed up and earning cash back too! ?” Well you easily can and I am going to give you a crash course on how to sign up in the next 2 minutes and earn cash back! Then every time you go to a website like: Nordstrom Rack, Lululemon, Amazon, Ulta, Target and more the cash back you can earn pops right up! You just click through links found on Ebates and then shop on the stores’ websites like you normally would. You literally get money back for the shopping that you were already going to do. 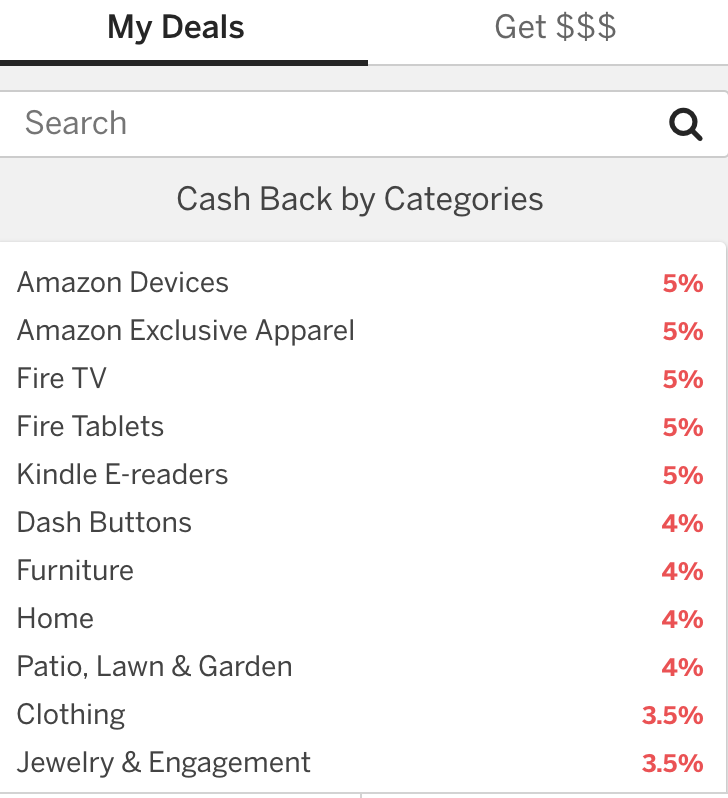 Here is a cool example from Amazon about the different cash back categories! It almost makes me mad that I wasn’t doing this all along and I don’t want that for you! I have earned over $250 in a year and a half. It really adds up. With that $250 it completely takes care of Liam’s Christmas gifts or could take care of an electric bill, car payment, etc. You could even have a deal with yourself that with that money back it will be what you treat yourself with! If you are already shopping, why not earn part of that money back! 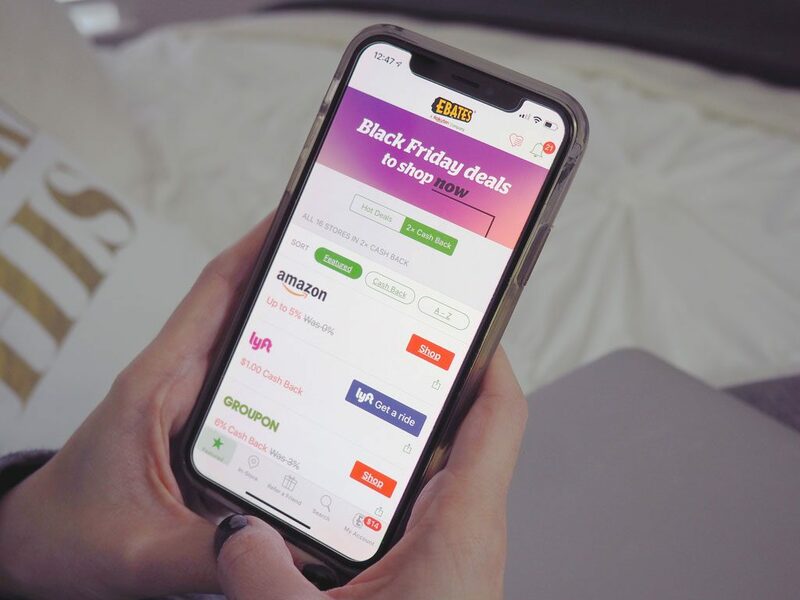 Right now if you sign up for Ebates you can double dip on savings this holiday shopping season (Black Friday, Cyber Monday, and get a $10 Welcome Bonus). So you’re saving money on all these holiday sales AND getting cash back! Also if you happen to be shopping in stores, use your app and see what in store cash back deals you can get as well! I really hope you sign up and start enjoying the perks and benefits of Ebates RIGHT NOW, AKA my biggest shopping trick! Lucky for you guys Ebates is sponsoring a $250 giveaway! So you can jump start your holiday shopping or just treat yourself! Use the Gleam widget below! Mandatory entry is you MUST sign up for Ebates using this link to be considered! Thank you Ebates for sponsoring this post. All opinions are my own. Thanks for sharing your little trick! I’ve heard all about cashback reward programs but have yet to sign up for one myself! I signed up for Ebates and got super lazy and never used it LOL I really should get to using it since it’s been super beneficial for a lot of people I hear. I use Ebates a lot since I do most of my shopping online too! Although I’m behind this year. Usually by now I’m done Christmas shopping and haven’t even started yet! I didn’t know the phone app has deals, I’m going to have to download that! I love Ebates! Everytime I shop online I use it! I remember my first cash back check! It was awesome!! I love Ebates because it really does work! I definitely going to keep using it! I love ebates because they offer money saving discounts on everything! Great tips and tricks you share during the holiday shopping season. I have heard such great things about ebates. I tried using it way back when and failed miserably. Maybe its time i give it another go! I didn’t really know about Ebates. Perfect timing before Christmas and planning for my son’s birthday. I’m so excited. I just signed up! You had me at “cash back options!” I live in another country right now, but I come home once a year. That is when I do all my shopping. I am leavign to the U.S. 18 Decemebr, so I hope I can see some cash flow before then. We will see! I love love love ebates. I joined when it was just starting and have earned big bucks since! I’m a big online shopper myself and this is the perfect platform for me. I haven’t even started Christmas shopping, I was trying to hold onto summer and fall. My daughter uses eBates a lot and she is getting me using it. BTW which theme are you using on this blog it’s really amazing. Can you share the download link of this theme please. I have heard so many great things about Ebates but haven’t started using it yet. I haven’t started the Christmas shopping yet, so I have to sign up for Ebates asap and start earning those cash backs now! Thank you for spreading a great deal this is a very nice post and perfect this coming Thanksgiving. Aww, ebates is fab! Have been using them for years, else I would totally sign up for the giveaway! I have used eBates for years. I love getting the cash back on purchases. I had not heard of Ebates before! I can’t wait to check them out, I love good shopping deals!! This is so useful! Cant wait to try some out! I’ve heard about Ebates but haven’t tried it for myself yet. It’s like throwing money away! I’ll have to look into signing up. I’m all for taking the stress out of Christmas shopping! But I must say I am quite organised this year. I use a similar cashback site, they are a brilliant way to shop! Sounds like a very convenient way to save some money! Thank you for the tip. Oh my God.. i love love ebates and i have been using it for a while now.. No better feeling than receiving the big fat check. Wow, this sounds really a good idea for all shoppers like my friends but don’t want to go in the mall. I will also share this with my friends and we are going try to sign up to get a best deals from Ebates. I always forget about eBates. I used to use them a lot. I just signed in and my account is still active. I’m going to leave it up and signed in so I remember to use it for holiday shopping today online! This is nice way for shopping. I will try it and see how it will goes for me. Sounds, you have succeful attempt at this method. 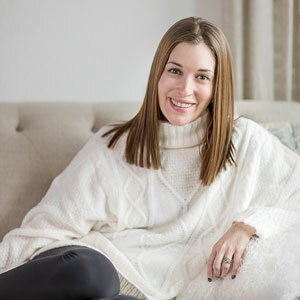 This is such a great post and can be very helpful especially this Holiday shopping. I absolutely love Ebates. They are the best and always have everything im looking for. I have to try that. It would be nice to earn some cashback from shopping especially around the holiday season. Thank you for letting me know about EBates. What else can we ask for? We’re getting a fantastic trick for shopping and there’s also a giveaway with it! I think Ebates is fab! I love Ebates it’s awesome to double dip and get extra cash back. Especially during the holidays! I use eBates all the time!! The extra cash back is so great. I’m looking forward to see how much I can save this holiday season. I LOVE Ebates!! 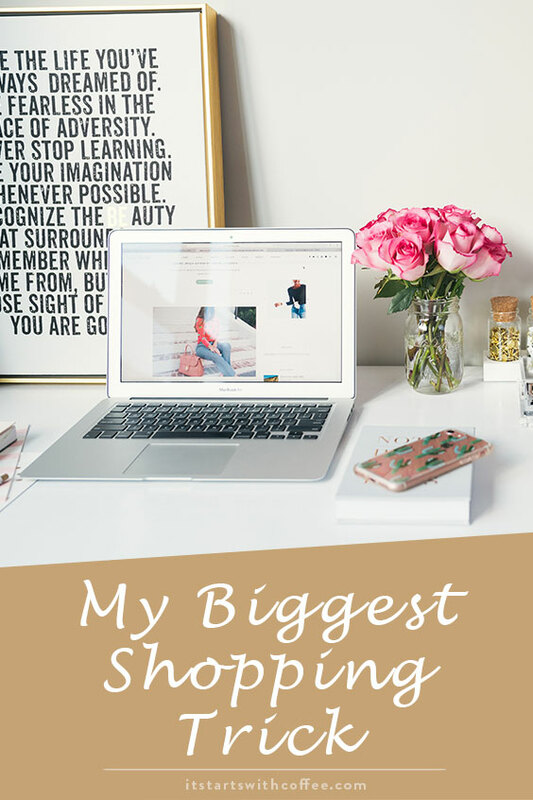 It’s my biggest not-so-secret shopping secret! I tell anyone and everyone about it!